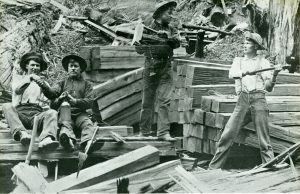 A little more than 125 years ago, the Mendocino Coast was alive with activity as men moved redwood from the forests down to the coast where it was gathered and sorted, milled or split, and then loaded onto ships headed for San Francisco and elsewhere. Before the Panama Canal, all building materials had to be shipped around the horn. The discovery of local redwood provided a vital alternative for West Coast construction. 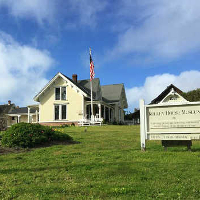 This discovery came shortly before the start of the Transcontinental Railroad and, within a few decades, more railroad ties were shipped from dogholes along the Mendocino Coast than almost anything else, though timber and other split-wood products, and other wood such as tan oak bark, were still shipped in great quantities. Many of the railroad ties produced locally were purchased by the Southern Pacific Railroad and used in California; other ties were shipped to places as far away as Peru. In the early days, hardworking men with a few tools could make a living cutting ties. Working alone with a properly prepared piece of wood, it took roughly an hour for a hacker to complete a tie, and a man could measure his hours in the number of ties he had stacked up by the end of the day. Often men worked in teams in some of the least accessible parts of the forest felling trees, which were then marked or bucked to the correct length. Once the tree had been cut as marked into smaller sections, the pieces were split apart using wedges and hammers, and any remaining bark was removed. Redwood, with its long, straight grain and natural resistance to rot, insects, and fire, was especially suited for railroad ties. Once the job was finished, the men would move to another area, leaving the slash or waste behind them. Though mills made more efficient use of the tree, they also increased the costs of producing the ties. Initially, split ties were preferred by the railroads over cut ones, in the belief that the kerf of the mill saw cut the wood at an angle, causing the finished tie to absorb more water once it was laid down. With roughly 2800 to 3000 ties per mile of track, the cost and nuisance of replacing ties created constant pressure to find more durable materials and better ways to install them. At first, the natural qualities of redwood were not displayed to their best advantage, as redwood is relatively soft, limiting a tie’s lifespan to about five years. With the invention of the tie plate in the late 19th century, all of this changed. A solid piece of steel, the tie plate sat beneath the train track and on top of the railroad tie, distributing weight across a larger area which greatly extended the life of the redwood tie. One testimonial from railroad magnate Collis P. Huntington indicates that redwood ties removed near Sacramento in 1890 had actually been laid in 1855, a seven-fold increase in lifespan and an apt reflection of the redwood’s enduring nature.